This is a fun letter game for kids who are learning letters. Alphabet activities like this one can make a game out of early education. Learning should be fun! Kids Activities Blog is excited to welcome Hannah from Making Boys Men as Quirky Momma for the day! She is here to share an interactive letter game to add to your alphabet activities repertoire. With Bud now at school we have ventured into the world of slightly more learning orientated play! Bud is learning his phonics and is doing great, but gets a few muddled up sometimes (d,b,p etc) so we’ve been doing a few letter games. I thought it would be fun to create an alphabet activity that used things we already had at home. We had a load of squash bottles in the recycling so I taped 2 letters to each bottle, one on the front and one on the back. You can see our lined up on the table in the photo above. Then I gave Bud a ball. He would throw the ball at the appropriate letter game bowling pin and try to knock it over. Once he’d got those letters sussed we turned the bottles round and work on the ones on the other side. We enjoyed this and have kept the bottles so we can do it again another day. It has been fun learning letters this way. Instead of naming the letter, name the alphabet sound. 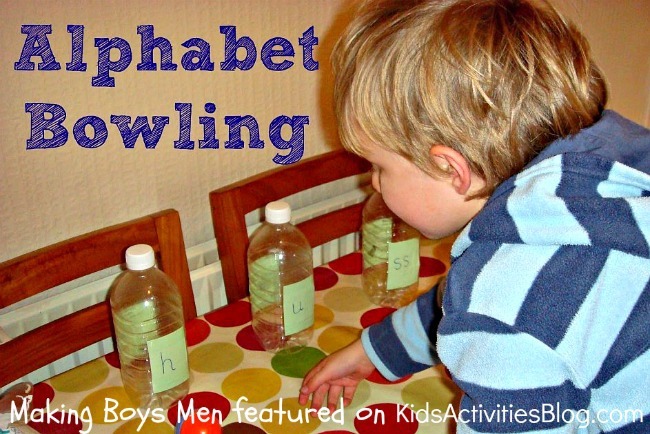 Create a bunch of letter game bowling pins and have the child knock over the pins and then name the letters attached to each one. Using the knocked-over pins, spell out simple 3 letter words and sound the out together. Using the knocked-over pins, have the child try and spell simple 3 letter words. YOU bowl and have the child call out the letters. Hannah is the British mum of boys. She writes at Making Boys Men and can be found on Twitter as @MakingBoysMen. Kids Activities Blog encourages learning fun! If you are looking for some more letter games or alphabet activities, check out some of our favorites.